Explore Hidden Gems in Orange County, N.Y. Wander off the beaten path for some unforgettable Hudson Valley experiences. Orange County, N.Y. – Located just 60 miles north of New York City, Orange County, N.Y. is known for its scenic landscapes, historic sites and acclaimed farm-to-table restaurants. Visitors come from far and wide to see these famous Hudson Valley attractions, but those willing to veer off the beaten path can also discover local gems that may stand out less in travel guides, but that lead to treasured experiences. Spend the day hiking along one of hundreds of trails across the county or browsing a collection of handmade crafts in the artisan village of Sugar Loaf. Extend your visit with an overnight stay in one of Orange County’s select hotels or charming B&Bs. The Orange County Tourism staff recommends visiting www.OrangeTourism.org for a full list of lodging, activities, and attractions. Elks-Brox Park, Route 97, Port Jervis: Take in magnificent views of the Neversink Valley and the Delaware River with miles of groomed hiking trails, picnic and barbecue areas. The mountaintop overlooks historic Port Jervis, New Jersey, and Pennsylvania. Open dawn to dusk. Call 845-858-4000 or visit portjervisny.org. Pacem in Terris, 96 Covered Bridge Road, Warwick: Visit a garden place along the Wawayanda River with sculptures by internationally known artist Frederick Franck. Chamber music series. Open May–October, Saturdays and Sundays, 11:00 a.m.–6:00 p.m., weather permitting. Visit frederickfranck.org. Seligmann Center for the Arts, 23 White Oak Drive, Sugar Loaf: Located on the estate of the famous surrealist painter and sculptor Kurt Seligmann, view an intimate collection of modern sculptures set into the landscape. The center also offers rotating exhibitions, workshops, and performances that interpret surrealism, trace its origins, and explore its contemporary resonance. Call 845-469-9459 or visit occitizensfoundation.org. 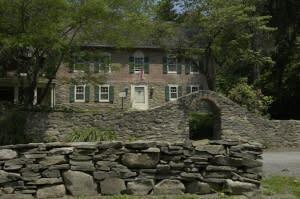 Gomez Mill House, 11 Mill House Road, Marlboro: Visit the oldest manor house in Orange County and the earliest extant Jewish residence in America. This 1714 Mill House also features an ice house, restored mill and dam. The property was a fur trading post and has been the residence of merchants, patriots, farmers, craftsmen and statesmen. It is part of the National Register of Historic Places. Call 845-236-3126 or visit Gomez.org. Be sure to visit Orange County Tourism’s Facebook page: Orange County Tourism NY. It’s a fabulous guide to up-to-the-minute postings of area events and activities, great times, and memorable experiences available to visitors. Also visit Orange County Tourism’s innovative and user-friendly new website: www.orangetourism.org. Photo feature: Gomez Mill House in Marlboro, N.Y.